The floors look very unhealthy and dirty if it consists of dark stains. These stains are usually formed from the food scattered over the floor, wine or liquid spills, and smashing of solid foods. Though this happens due to our negligence, but the spots thus formed become very rigid and stubborn over the passage of time. Removing them using hand or wet cloth does not seem correct, and moreover, you are not going to get a spotless tile. 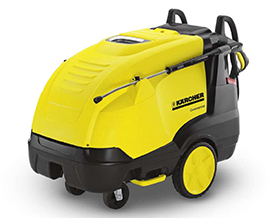 The best method that you can adopt is to clean the floors using the Karcher pressure washer cork, which immediately acts on the surface and scrubs off the coloring stain from the floor. This can happen on an immediate basis because the blend of hot water and the soap solutions tend to soften the rigid particles so that it can be completely sucked up from the surface. Once the particles get moisturized, they become loose that further makes it possible for the device to extract and remove them from the deeper pores.